Belle On Trend: Friday Night Outfit: Stripes! Happy Saturday! I was up bright and early, as I proctored the ACT at our school. How's your weekend going so far? We are heading my colleague's baby shower this afternoon, then cheering on the Irish this eve! We snapped some pics from last night's outfit in front of our new and improved YELLOW front door! Many thanks to Mike for coming up with the idea, going to Ace Hardware to start the project, realizing he needed to bring our yellow Adirondack chair with him to match the color, going back to Ace with the chair, washing the door and the chair while he was at it, painting the door (twice), hanging the door back up, and switching our screen door to a glass for the colder temps. Writing that just made me tired, let alone actually doing any of it. HAHA! I love you, Mike! THANK YOU! Last night I threw on an easy outfit for a progressive dinner with my pals in St. Charles. We swapped locations (if you caught my last post, we were going to do the progressive dinner/crawl in Geneva, but it was toooooo cray with the Festival of the Vine happening). Just as well because St. Charles wasn't packed at all, and we hit up some of our favorite restaurants. It was so fun! Apps and drinks at Puebla and then we walked down to The Office for entrees. I had to head out to get to bed to proctor, but the rest of the crew forged on to McNally's to end the night! The fall temperatures are great for layering, and I did just that last night with my quilted Burberry jacket, so I was set for the walks between restaurants. Just a disclaimer: I will be the first to say I'd never pay $600 for a jacket, but this was a gift from my ex-bf (haha), and I wear it ALL THE TIME (read more about it here). I would go for a more inexpensive version, instead, like this one under $200 or this one under $130. My Burberry jacket is from 2012, and again, I never stop wearing it. But, I still think $600 is insane for a jacket. 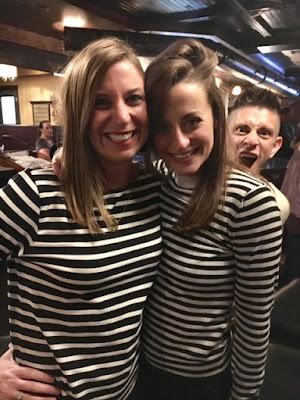 My striped top was from last year's J. Crew releases, but any striped top will do for an easy-going Friday night look! Stripes never go out of style, and you can pair them with statement earrings or a bold necklace. Stripes are super easy to dress up or dress down. I am a huge fan of Loft's curvy denim skinny jean collection. These jeans are a couple years old, but every year I add a pair to my collection. I love to cuff them at the bottom if I'm wearing booties. For reference, I am in a 28/6 in these. They stretch throughout the day which is great because I hate feeling like a stuffed sausage in my jeans. However, they don't get saggy! A perfect blend of stretch without the sag. Also, they always go on sale. I've never paid more than $40 for a pair of these jeans. My tassel earrings were (literally) $4 at a store's closing, but here are similar ones! My gold monogram necklace was a gift from Anna for being her MOH for her wedding. It's my old monogram (mHm), but too darn beautiful not to wear! Find it here. Also, Moon and Lola offers 15% off your first order! They ship your monogrammed masterpieces out so quickly, too, and are the nicest people ever to work with. I highly recommend Moon and Lola! These Toms booties are workhorses in my closet (and they are on sale!). You guys know I'm obsessed! Haha! Even knowing I'd be walking restaurant to restaurant, I knew these Toms booties would be uber comfortable. I could gush about these all day, and I typically do! haha!! And the Lunata bootie (closed toe and leather for winter) is 50% off! I am totally buying a pair to add to my collection! Finally, I love pairing black and white with a pop of red lips. I have a few different Mac red lip colors that I love (Brave Red and Mac Red), and I rotate through them. Also, Mike and I split a Reuben at The Office, and he INSISTED we get the full pound of meat version, LOL, because he said economically it was better (and only $2 more than the half pound one). I am dying laughing and eating my words (and the leftover meat) because today he made a corn beef scramble that was of course amazing. So we definitely got 4 meals out of this epic sandwich. LOL. Even though I told him it was a bad idea. hahah! You were right, Mr. Econ Major!! Love you! Sending lots of prayers down to everyone in Florida in Irma's way. Thank you! I agree! And so many affordable options-- yahoo! Are you in the mourning this Monday morning? I know we are! What a nailbiter of a game! Now, let's get to your stripes; super super super cute! You are just a doll and can I say yellow door and Adirondack chair, super super cool! Have a great day sweetness! Oh my gosh, we totally are! Such a heartbreaker. But they did so well, all things considered! I couldn't believe how many Georgia fans were at the game! Thank you SO much about the door and the chair! I have to say it's all thanks to Mike, though! He is the designer of all things house! In love with that shirt, love the sleeves in particular! omg, thank you! Those tulle sleeves were the selling point for me, for sure!! :) I wish it was still out!! ahh!! But, J. Crew always has those little touches of tulle which make me so happy. Thanks for stopping by my blog, girl! Thank you so much, Lauren!! I ended up getting the tassel earrings for $4! A store was going out of biz! I couldn't believe it!